While the use of herbal remedies to cleanse and fortify the lungs has a long history, the use of homeopathic essential oils has made it easier to get the extracts of certain herbs inside the lungs. For example, eucalyptus oil, perhaps the most commonly utilized essential oil for the lungs, is a potent decongestant, antiseptic and expectorant that benefits the entire respiratory system. By administering 10 to 15 drops of the essential oil into warm boiling water, you can create an effective herb inhalation for cleaning and strengthening the lungs. Add two to three cups of water to a clean saucepan or small cooking pot. Turn the burner on high and bring the water to a boil. 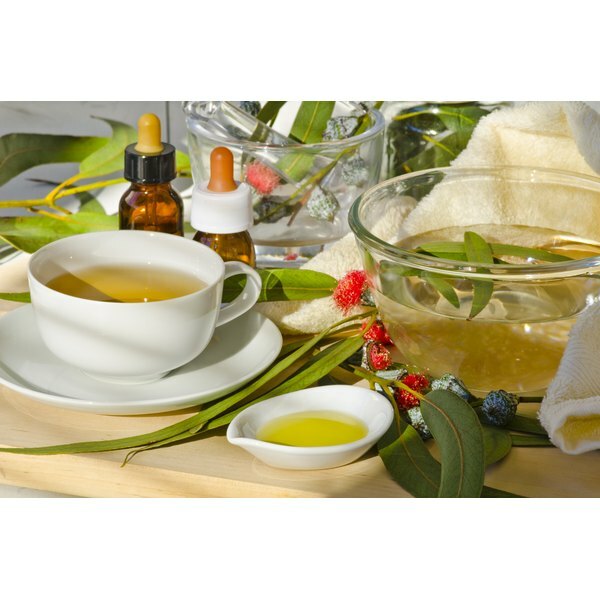 Add 10 to 15 drops of organic eucalyptus essential oil to the boiling water and cover the saucepan with a lid. Remove the pan from the burner and turn off the burner. Bend your head over the pan and arrange a towel to hang from your head around the pot: this will help ensure that the vapors waft toward your nose and mouth. Remove the lid from the saucepan and breathe in the hot eucalyptus steam that emerges from the pan with deep breaths through your nose. Breathe deeply at a count of 10 to 15 seconds as the eucalyptus vapors enter your lungs and hold your breath. Gently exhale and repeat the deep breathing up to three times. If needed, add more drops of eucalyptus oil to the pot. Repeat the eucalyptus oil inhalation twice a day as needed and any time that congestion symptoms occur. Both eucalyptus and marjoram essential oil make effective inhalations for strengthening the lungs. While it is generally recommended that you do not mix the two oils in one inhalation, you may mix 1 to 4 drops of both eucalyptus and marjoram essential oil into a bath for respiratory benefit. Keep your eyes closed while inhaling the essential oil steam to reduce eye watering or burning.